The fire safety officers are the fire protection specialist within a company. The fire safety officer is responsible for the installation and supervision of the fire protection equipment as well as the contact to local fire departments and to all employees. As members of the association of fire safety officers (Verein der Brandschutz-Beauftragten in Deutschland e.V. – www.vbbd.de), we can give your company our fully professional supporting this area. For industrial, medical or caring facilities (hospitals and care homes), the courses last 5 days and contents are based on the vfdb – guidelines 12/9. Correspondence course: Your employees receive our training material. Preparation time is approx. 4-6 weeks. An instructor is available per telephone during this period. One-day hand-on location training concludes the course. Our instructors are qualified fire safety specialists e.g. Fire-fighters etc. 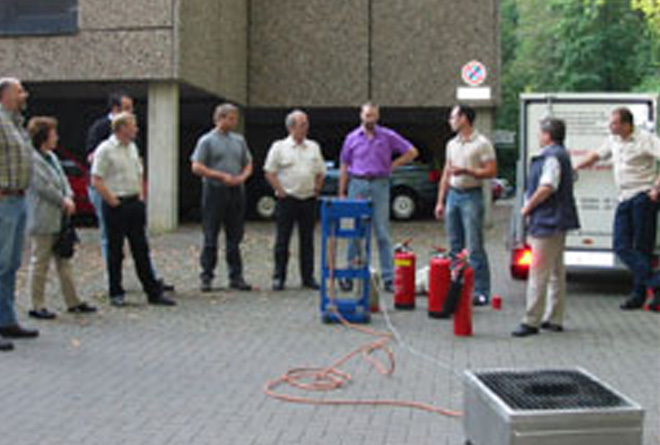 and are well equipped to train the specific qualifications needed for the company fire safety officers. Itemisation of, and compliance with the legal requirements of fire regulations e.g. alarms, fire evacuation and rescue plans, welding and electrical work, etc.